Does The Golden Rule Apply at 2am? Now let’s look at Confucianism, Hinduism, Buddhism, and the Non-Aggression Principle in this order. These are good principles; reciprocity makes for a good baseline. 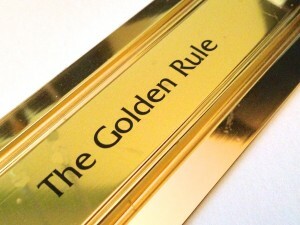 Jesus, however, did not take from these when he taught what’s commonly called the Golden Rule. The foundation of the Golden Rule predates these since Leviticus is dated between 1279 and 1445 BC, depending on when Exodus is dated. Jesus took it a step further; he made it active rather than passive. The others say ‘do not’, Jesus taught his disciples to ‘do’. It goes deeper than just being nice and polite. This point was made to me a few weeks ago. My wife and I had a very pregnant friend who was due any day. She did not have a way to the hospital and was relying on us. I picked up Casey at 11:30pm from work, and went to sleep as soon as we got home. I doubted we would get a full night’s sleep. It felt like I had just closed my eyes when Casey woke me up. I reached for my phone to check the time…1:57am. Grumpily, I asked if anyone else could take her to the hospital. Even as I was saying it, I was getting dressed. Uncaffeinated, I walked out to the truck, grabbing my keys on the way. I am not very ‘saintly’ at two in the morning. Thirty-Five minutes later, we arrived at the hospital. We picked her up, and then drove into the city. Not long after we arrived, her boyfriend was dropped off. We got back home at 3:40am where I bee-lined for the bed. At 1:09pm, she had her baby boy. This went beyond being nice. Can we all agree it is nicer to get to stay asleep…or is it just me? That’s why Jesus made the Golden Rule situational. It involves putting yourself in another’s shoes and asking what you would like someone do in this or that particular situation. If someone knocks my schoolbooks out of my hand, what do I want others to do? This is my first day here and I feel out of place, what would I like others to do? My face is all over the news for something bad, how would I like others to respond? It is hot, and my truck has broken down, there are no towns or friends nearby, and what would I like the next person to drive by do? I have had a long day waiting tables, these people are rude, and demanding to me, I wish they would treat me how? It is easy to think about, hard to do. There are people in these situations and we have seen them at least once or have been in a similar spot. How we answered these questions is how we should respond to people in these situations. I know I have a lot of room for improvement. Do you?